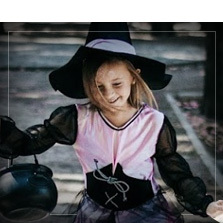 Witches, the girl from the exorcist, wolf girls, vampires, draculas, zombies, skeletons, monsters...At Funidelia you will find the best Halloween costumes for girls, so that your little girl can transform herself into the Halloween Queen...Oooh! If your little girl is already thinking about the best girls outfit for Halloween, you are in the right place to buy it. We have loads of terrifying Halloween outfits that will make your little girl really happy. 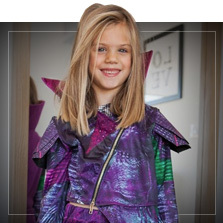 From the most classic witch outfits to the most wanted outfits for kids such as Monster High or Descendants. 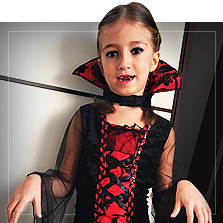 With these original Halloween costumes for girls your little girl will be able to turn into the evil witch from the story, a beautiful vampire, a horrifying cursed mommy from far away Egypt...or into one of the most mythical characters from the cinema or the TV such as The Ghostbusters, Wednesday Addams, Dracula, Clawdeen Wolf. Even she likes authentic scary things and the bloodiest Halloween outfits for girls such as zombies or the girl from the exorcist, we also have a children's version, so that your child is dressed to scare! 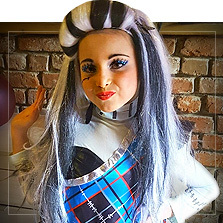 Make next Halloween the best party for you little girl with the most original costumes for girls! 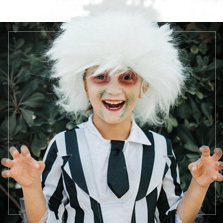 If the little girl of the house is a fan of horror movies and she likes to celebrate Halloween with her friends, at Funidelia you will find Halloween costumes for girls so that your sweet little girl will have a frightful night. 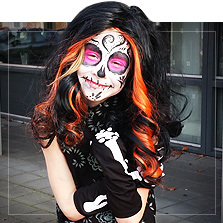 From the most classic costumes for girls such as witches, skeletons or pumpkins to the most fashionable ones like zombies. At Funidelia we have a Halloween costume for every girl. If she is a little vain she could dress up terrifyingly pretty like her classmates from Monster High. If she likes to run, jump and spin around a thousand times, we have comfortable costumes. If she likes a character from the television or the cinema you could make a blood-stained version of them. She could be Wednesday from the Addams Family or even the corpse bride. 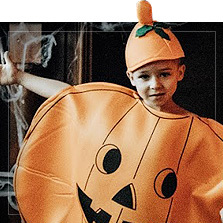 These and other original Halloween costumes for girls are available for you in this section.